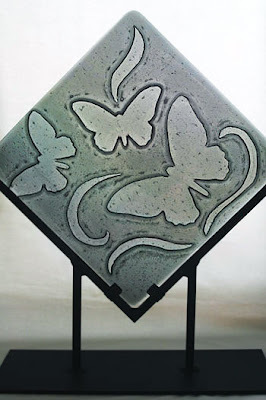 The images of these butterflies were carved out of this smokey gray transparent glass not with a chisel but using the aid of a kiln to control the time and temperature the glass was exposed to. As the glass softens it can pick up the shapes which I have carved from fiber paper/board and transfer those impressions into the glass. A technique often referred to as kiln carving. This skill enables all kinds of design possibilities. I used this technique to create the items I referred to in my posting back in September of 2007. Although not an overly complex technique there are some important factors to consider in order to be successful. For this reason I teach a 1-day workshop on kiln carving at Wire Designs Studio. The next class is scheduled for November 2nd and there are still a few spots available. If this is something that interests you, please contact Wired Designs Studio at (210) 495-4495 to reserve your spot. The other day after many hours of toiling at my desk on the computer listening to music from my ipod, I decided to reward myself with a brief distraction on my way home from work. I stopped at a used book store to rummage through the art, poetry and fiction sections. You never know what you will find at a used bookstore. Humming Warren Zevon’s song Splendid Isolation, which had played as I worked earlier that day, I scanned the books in the stacks. As I mumbled “I want to live alone in the desert, I want to be like Georgia O’Keefe, I want to live on the upper east side and never go down in the street… Splendid Isolation, I don’t need no one….” my eyes came to O'Keeffe and Texas by Sharyn R. Udall. Periodically I imagine what it would be like to run away to some deserted place and leave behind all my present “distractions”. It’s a nice illusion anyway, one which for me often attaches itself to artists like O’Keefe. Just a row or two over I came to Trust the Process: An Artist's Guide to Letting Go by Shaun McNiff. Known for his work on creative art therapies, McNiff writes about creativity for everyone in everyday life. This book was quite a reality check in comparison to my dream above. Blatantly challenging the idea that one need locate art in a distant place far removed from daily/ordinary life, he works from the concept that creation is a process which makes use of all our experiences (even those “distractions” I want to run away from). This book addresses those things we are all so familiar with mistakes, the blank page, repetition, creative blocks and working with what you have. Although we may address these things daily, reading about them brings to our consciences those simple truths we so often forget. Weather we deny them as I often hear so many do when the say “well I just not creative” or simple forget, it is the simple things which often hinder our ability to stretch our creativity. For this reason, reading books like Trust the Process can often be so helpful. Not to teach us something entirely new but to remind us of what we already intrinsically know, somewhere deep down, and have just forgotten or simple denied. 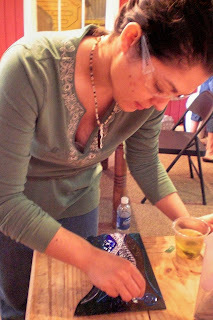 We are fast approaching the end of 2008 and there are not many San Antonio Glass Art Guild (SAGAG) meetings remaining in this year's calender. If you attended in September to see Milissa Montini's video demonstration of pulling murrini (glass cane) you know how good these meetings can be. You're not going to want to miss these either. 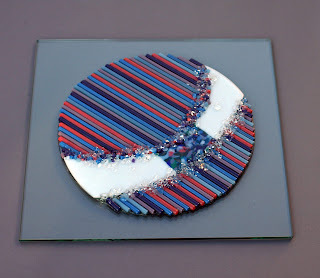 October 30th at 6:30 pm, Liza Connell with Crystal Box Studio will be presenting on ways to embellish glass jewelery with simple to the intricate techniques using wire and Precious Metal Clay (PMC). 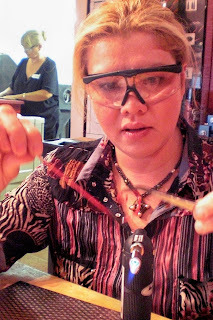 Liza is an Senior Instructor for metals at Wired Designs Studio. If you have never taken a class with Liza this is your chance for a preview. If you have, I need say no more you already know how wonderful she is. The October meeting will be at Casarita Restaurant at 2895 Thousand Oaks just West of the Jones Maltsburger Intersection. The November meeting is tentatively scheduled for the 6th to accommodate visiting artist and instructor Roger Thomas. The SAGAG programs committee does a phenomenal job of exposing our members to visting artist from around the nation whenever possible (reason alone to be a member of SAGAG). These are opportunities you don't want to miss. More information will be available soon regarding the location. 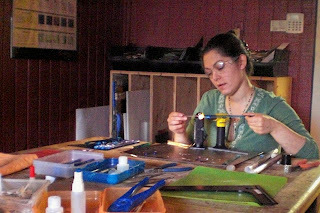 As a reminder SAGAG is open to anyone who works in glass at any level from hobbyist to professional and to those interested in glass art. 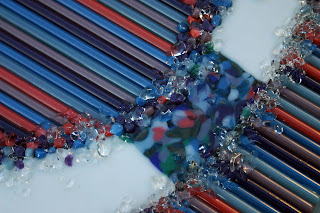 Our mission is to promote community awareness, understanding and appreciation of the glass arts and to maintain a support network for artists, which provides educational, mentoring and marketing opportunities. There is a certain something special about receiving a package in the mail. To sort past the bills and junk mail and find a jewel. Something which arrives by mail took deliberate intent on the part of the sender including the preparation of the package, postage and a trip to a post office. The effort involved is greater then just a light flick of a pinkie finger to an Enter button of a keyboard. That effort often involves intent put as ink to paper and wrapped in brown packaging. This week I received two such treasures. The first was a card which traveled all the way from Lithuania. Sent to me by a fellow member of Postcrossing, it was obvious Leva had taken time to select the right card to send as ambassador across the sea. A card representing of the work of local Lithuanian graphic artist Sigute Ach, titled "Melie, pilna tylaus plaukimo maza valtele" or "Love full of silent rowing by a small boat" it brought a smile to my face as I brushed past ordinary white envelopes with cellophane windows to find this whimsical packet with a small treat inside. The second was a manila envelope sent to Wired Designs Studio. I don’t normally receive mail at the studio so my interest was peeked when I receive a call informing me I had received a package from Austin, Texas. A package? For Me? With child like curiosity I came to find this nondescript package contained photos taken by a student documenting the events of an Introductory Fusing Class. Thank you so much Farah! I meet Farah for the first time during San Antonio’s first Luminaria event. It was not long after that she joined us at Wired Designs for a workshop. With her photo journalism background it was only natural she would want to document the workshop with her photos and I am glad she did. Her are just a few of her shots. Having taken a few days to recuperate and reassess after several weeks of local art and craft fairs, I thought you my be interested in a brief update on my recent activities. I would like to start by thanking those of you who made recent purchases. The proceeds of these sales go directly to new supplies, tools and to pay for workshops with national instructors. If you have purchased my work over several years you will see the quality and complexity of my work has increased. I could not have done this without your support. Thank you. While selling work in Market Square and at the Encino Park Craft Fair, I had the opportunity to meet fellow members of the San Antonio Visual Artists (SAVA) group. This fast growing group of artists has expanded so much in the past year. 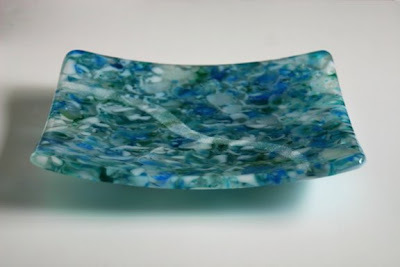 I am excited to see the number of glass artist joining has justified our own section in the groups directors of artists. SAVA is holding its' first annual juried art show Admiration, for which I am excited to say I have been excepted. 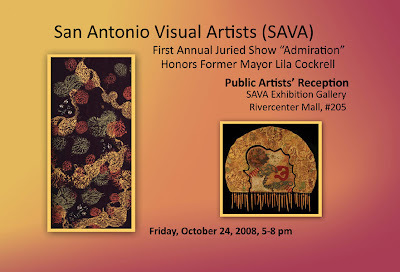 And it seems to have become common for me to bump into SAVA members at events around San Antonio. For example, this past weekend I meet Christian Deworde and Tony Garcia selling their work at the Encino Park Craft Fair. As we struck up a conversation Tony and I realized we were both excepted into SAVA's Admiration exhibit scheduled to open to the public on October 24th. I was very excited to have been excepted into this inaugural show and equally excited to meet another participating artists. Christian Deworde - Oil on Wood 16x24"
One of Christian Deworde's pieces came home with me from the Encino Park Craft Fair. Christian painted many of his pieces on wood adding an additional depth/texture to his work as he worked oil paints into the grain. 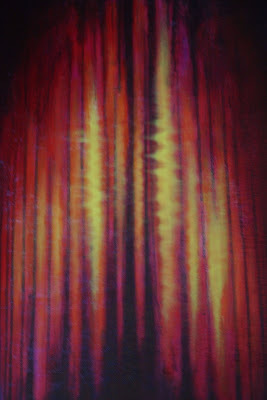 He was the second artist I spoke to this weekend who referred to dreams or visions as material for his work. I find it intriguing how different artists find inspiration. Using one's dreams is so very different from the way I work. Thank you Christian for sharing you inspiration as well as your work.